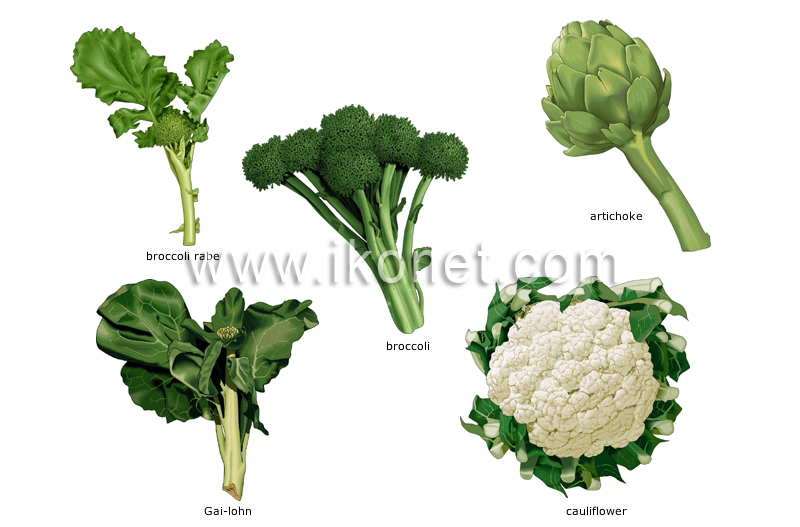 The flowers or flower buds of edible plants eaten as vegetables. Also called Chinese broccoli, its delicately flavored leaves and stems can be eaten raw or cooked, prepared in the same manner as broccoli. Its slightly bitter stems, leaves and flowers can all be eaten, prepared like broccoli. Especially valued for its soft fleshy heart, it is often served with a dipping sauce; the leaves surrounding the heart can also be eaten. The head, composed of immature buds, is either white or purple; it is eaten raw or cooked. Native to Italy, it is often green and occasionally white or purple; it is chosen primarily for its flower buds but the stem and leaves are also eaten.